It's all Writer's Workshops' fault. I blame Writer's Workshop (and Reader's Workshop too) for making me into the writer I am today. I had time to read, time to talk about what I was reading, time to visit the library and explore books that were interesting to me, time to know myself as a reader alongside all the reading I did for school. I know I'm not the norm, I loved reading classics in high school. I felt really cool reading books that felt important, except for James Joyce's A Portrait of The Artist as a Young Man. I loathed reading that book actually. It was okay though because I knew that even if that book wasn't for me (and it really wasn't for 17-year-old me), there were others that were for me. Without Reader's Workshop and the fact that I knew there were other books out there, I might have judged reading solely on my experience with that book. I might have *gasp* stopped reading. I could have decided it was me and my trouble to connect with this particular book and applied that to every book out there. 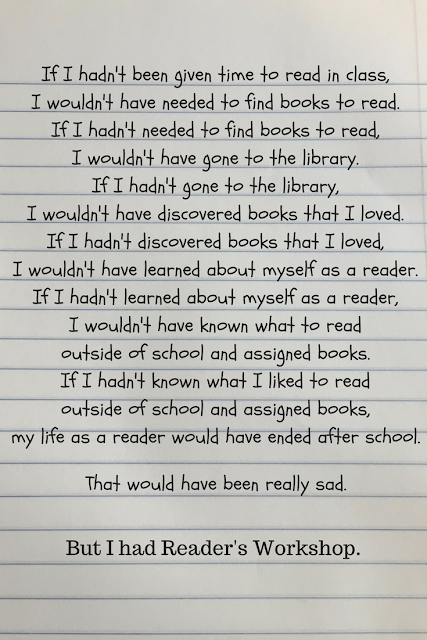 But no, thanks to awesome teachers I had in middle school and especially in high school, I knew there were other books. My identity as a reader didn't hinge solely on the books I was assigned to read in school. 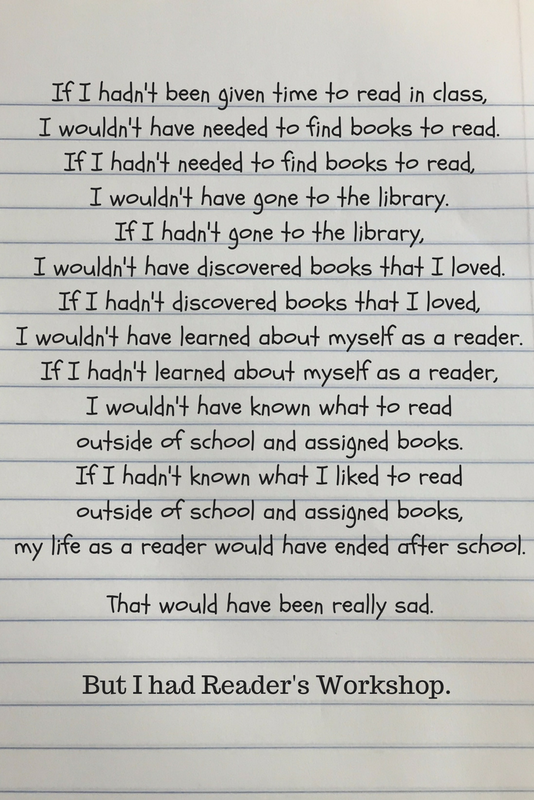 It's definitely Reader's Workshop's fault for helping me grow as an independent reader who loved reading outside of school as much as in school. Because if I hadn't loved reading books so much, I wouldn't have all the experience with stories and words that gave me a great foundation for being a writer. Reading and writing goes together. They directly influence, impact, and interact with each other. Writing is taking reading to the next level. Readers soak up all these wonderful words...but the real trick is to now take all this knowledge of stories and words and to create your own. 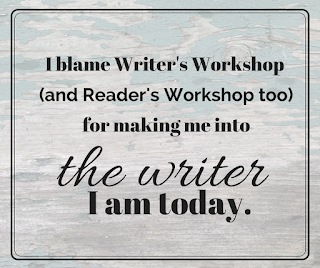 While I can point a finger at Reader's Workshop for making me a writer, Writer's Workshop has to take some of the blame too. I had time to write, time to discover topics I wanted to write about, time to share with peers and give and get feedback, time to confer with my teachers and get their feedback, time to share my writing, time to understand that writing is a process and I could navigate it. 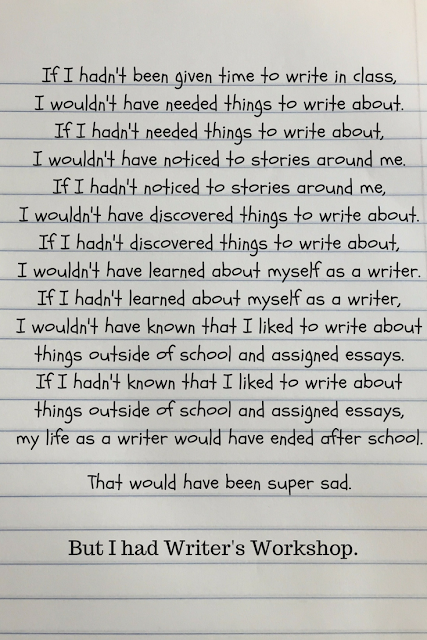 Most of all, I had time to get over that little voice in my head that told me I couldn't write or it wasn't worth it or I wasn't good. Lots of people have that little voice. I do sometimes, but most times I can just sit down and write. The thing is, last year I had coffee with one of my high school English teachers and we were talking about free writing. I told her my rules for free writing and she pointed out that I shouldn't forget about not listening to the little voice in your head. Guess what?! I had totally overlooked it! Why? Because I don't have to fight that little voice! 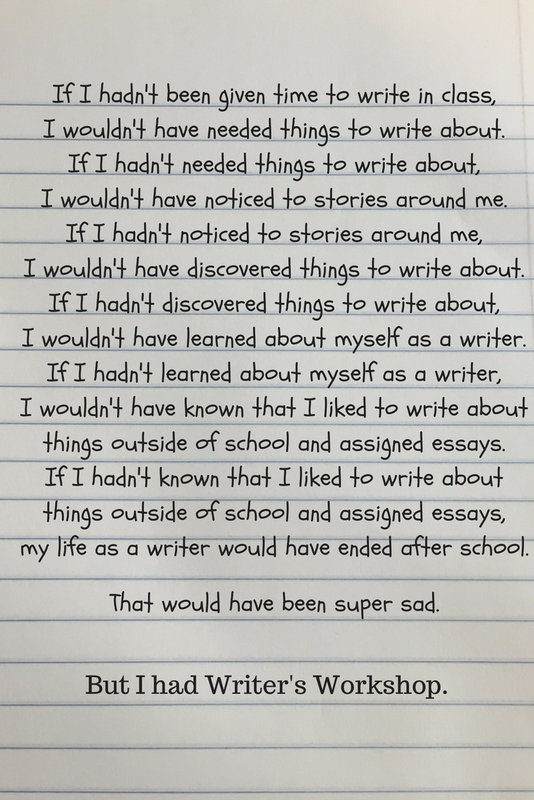 I don't have to fight it because my awesome teachers helped me get over it in Writer's Workshop. She had it in her mind because she remembers how important it is but I forgot it because she did such a good job of banishing it from my brain. I wouldn't be the writer I am today without Reader's Workshop and Writer's Workshop. 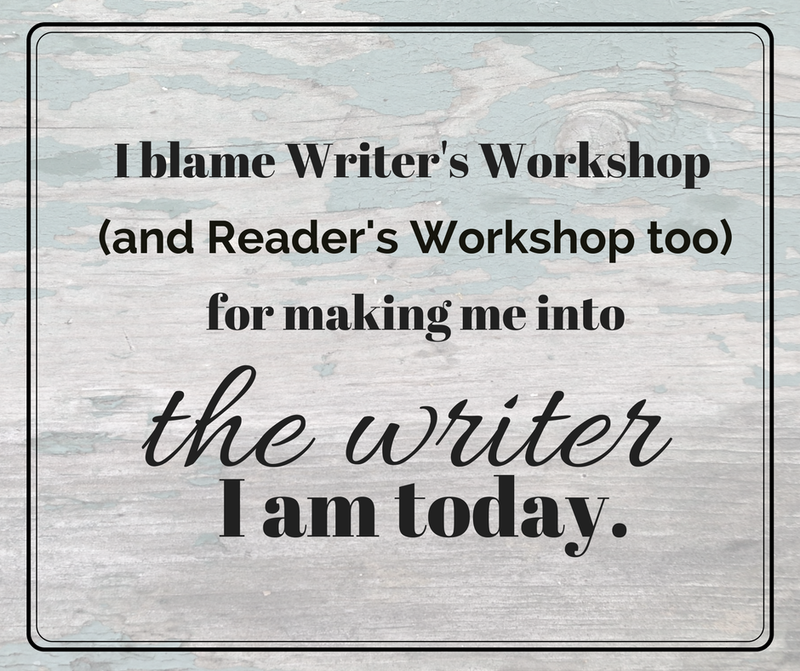 Obviously, I'm a fan of Reader's Workshop and Writer's Workshop because I know the power of Workshop firsthand as a student who experienced it. But there is so much out there about the benefits of using a Workshop model in teaching literacy. 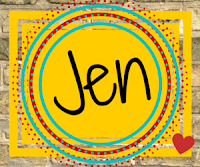 Thanks to Stacey Reidmiller, I discovered Megan Smith's new blog One Book, One Pen where she shares ideas for how to get started with Workshop and I'm in love already and can't wait to read more. I'm so excited to share it with teachers in my district. I'd love to hear which are your favorite workshop resources so please share in the comments! So Excited for Teachers Write 2017!